Have you cooked with Polenta before? If so, let me know what you made in the comments below, I’m very curious to know…!! We’ve had thunder storms here this week with a lot of rain and some sunshine every once in a while, I was in the mood for something different, savoury and comforting. During my weekly shop at the local South Asian store I came across a packet of coarse Polenta (cornmeal)… and so it began! 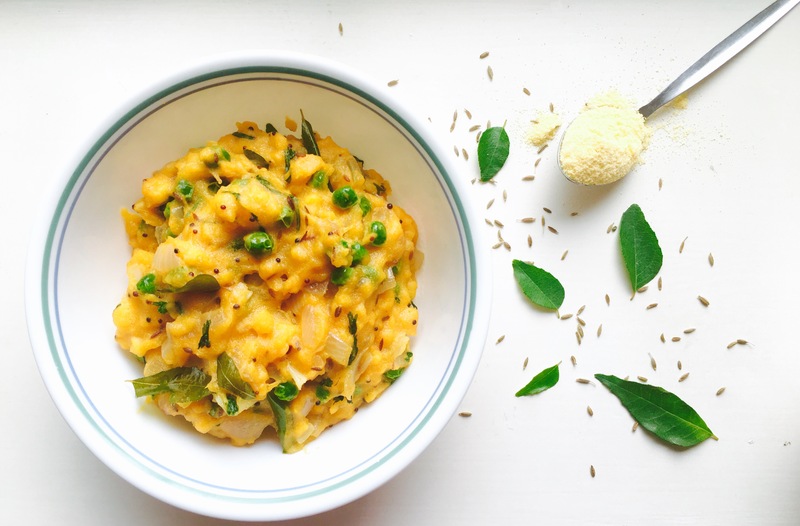 Got back home from work and I wanted to try a variation of a South Indian dish I’ve heard of many times before but have not had a chance to try out, this is normally made with Semolina, however I feel – after tasting it, works just as well with Polenta (cornmeal) too! I like the Semlolina version a lot however, this was special as well! Then into a wok on medium heat, add the oil, once hot, add in asafoetida, cumin, urad dal, mustard seeds & curry leaves and as they splutter add in the green chill, ginger and onion & saute till translucent. Then add the turmeric and mix, add the peas and allow to cook for a minute. Quick tip while adding the polenta is to keep stirring with one hand as you add it in to the wok with the other to avoid any lumps that may occur otherwise! Turn the heat down to the absolute minimum and give it all a good mix, add a bit of water if you like a softer consistency and cook with the lid on for 2 minutes.